how does wood beam attach to concrete? Depending on the height of the wood beam, there are several ways wood beam can be attached to a concrete foundation wall. 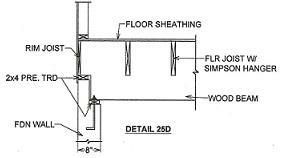 Details 25a thru 25d below show 4 different ways a wood beam can be attached to a foundation wall. Detail 25a is the easiest because there is no extra work to be done to the beam or foundation wall to make the connection work. The only problem with this detail if the beam depth is significantly higher than the floor joists the connection at other sides of the building will not work. Detail 25b will work for a beam that its depth much higher than the floor joists. In this case the beam needs to be notched with piece of Simpson Hanger straps nailed to both sides of the beam as shown in the detail. It will also require a bearing angle to be bolted to the foundation wall as shown. 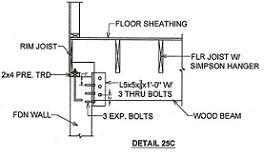 Similar to detail 25b, detail 25c require the beam to be thru bolted with with 3 bolts. Since the beam will need to be notched, it will require Simpson Straps on both sides of the beam the same way in detail 25b. The two L5x5 angles can be thru bolted to the beam first, lower the beam to proper height and provide temporary supports while the holes on the foundation wall are being mark and drill. The last detail requires the foundation wall to be notched at the location of the beam. The notched portion of the foundation wall needs to match the bottom side of the beam. 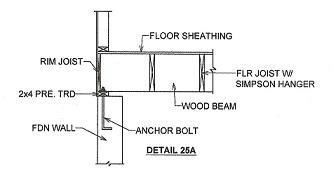 two anchor bolts can be installed with pressure treated piece of 2x4 from which the beam will be rested. In this case, the notch on the beam will not be required unless the wall above the wood beam needs support.